Hi, vegetarian carnivores! I am so excited to share this post with you guys because this is one recipe that I have been getting a ton of requests for and I wanted to make sure I made the absolute best version to share. Soup is one of my favorite foods to have, regardless of the weather outside. Seriously: catch me in shorts and a tank top having soup in the summer. And that is why I get so excited for the fall and winter – so I can make and enjoy the best soups ever. If you have not yet read my awesome double feature soup post, click right here and read all about my delicious french onion soup and roasted butternut squash soup, both of which are totally vegan friendly! And then come back here to read all about my vegetarian chicken noodle soup! Like my other soup recipes, this soup is one pot, and all done in the fabulous Instant Pot! It is easy, delicious, and is almost no time commitment at all. It is a great Thanksgiving side dish for any picky eaters and makes a really tasty leftover dish as well. This is something you are going to want to keep in the fridge at all times! 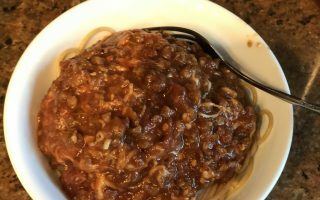 I have done a lot of searching for the best meat substitutes, by trial and error, asking my meat loving friends to taste test my creations, as well as researching how things are cooked and what spices are used. I have said this before and I will say it again: meat is only two things – texture and spices. Mimic those and you’ve got yourself an incredible cruelty-free substitute. In traditional chicken noodle soup, the majority of recipes I have gone through have used chicken thighs. Don’t ask me what the difference is, because frankly I do not know. However, I can tell you that it probably has to do with a difference in texture from other parts of the chicken. I used Trader Joe’s Chickenless Strips for this recipe, and boy am I glad they brought these beauties back because they had discontinued them for a while in the Irvine location, during my college years. These Chickenless Strips are super versatile because they can be manipulated in a variety of ways depending on the application. They come lightly seasoned, which, for most recipes, is a pretty helpful thing. Anyway, I have used them in pasta as a protein kick and they definitely have held their own. This is why I decided to give them a go in vegetarian chicken noodle soup – they hold their own and will not fall apart if boiled in soup. Spoiler alert: I was right! 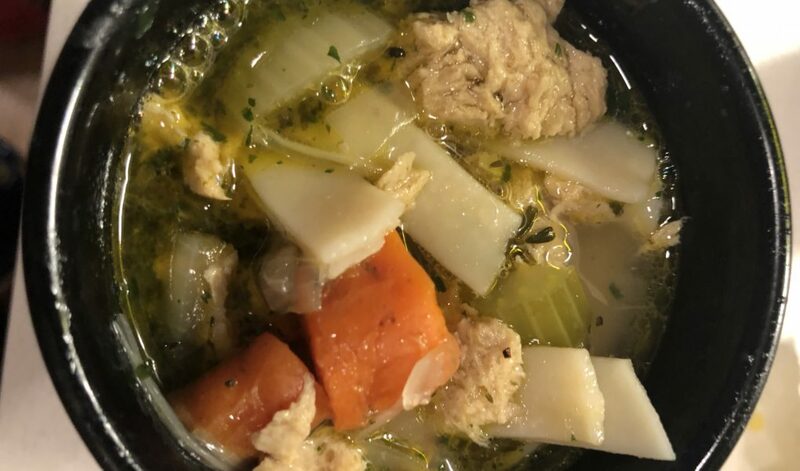 This soup came out incredibly well and I am so happy to share one of my most favorite recipes thus far. You are definitely going to love this. You probably have many of these staple ingredients in your home already, and had no idea they could combine to yield such a flavorful dish. I also bought egg noodles from them in their refrigerated section. These are fettuccine egg noodles and already cooked. For this reason you will see that I added them in after pressure-cooking to not turn them mushy. However, if you have dried egg noodles that are not cooked yet, you may want to boil them in a separate pot with salted water or if you like slightly mushy noodles, you can add them to your pressure-cooking round too. Really, whatever you are comfortable with. Set Instant Pot to saute mode. Add in oil and onions and saute until translucent. Add in celery and carrots and continue sauteing. Add in water and broth base and mix until fully dissolved. Add in chickenless strips and mix well. Add in bay leaves and thyme. Close the lid and set the Instant Pot to sealing. Set to Soup/Stew mode and pressure-cook for 10 minutes. Quick release the steam and stir well. The seasoning that was already there in the chickenless strips is probably not enough to season the whole soup so slowly add in your Italian seasoning, tasting along the way until your preference has been reached. Add in your egg noodles. If you are using refrigerated fully cooked egg noodles, just 4-5 minutes in the boiling soup should loosen them up enough. Keep stirring so they do not stick together. Lastly, add in your parsley. You can use dried or fresh. I have found that it does not make a big difference in the overall taste. Can you guys believe that the “chicken” in this picture is not real chicken?! I made this and did a double take because it just looked so real. The chickenless strips are awesome because pressure-cooking them loosens them up and gets them to soak up the juices and get really tender and delicious. I made what should have been around 5 servings and loved it so much that I ate it all within two days. This keeps well in the refrigerator for up to 5 days and reheats well too in the Instant Pot on “keep warm.” It is a perfect Thanksgiving side dish that is sure to please! And you know what time it is…. time to tell me what you think! Are you excited to make this for Thanksgiving, and really every other day of the year? Let me know what you think in the comments below! 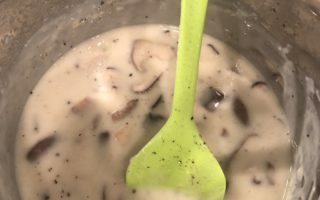 Stay tuned for my next recipe: a delicious Thanksgiving mushroom gravy recipe coming up right before the big day this week! 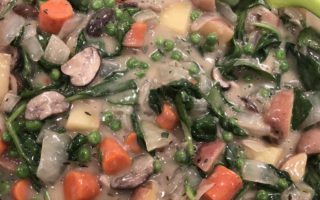 Next ArticleVegetarian Thanksgiving Gravy – Easy and Tasty! Oh My Goodness! My mouth is watering after your article. Love Trader Joe’s too. Heck with with waiting for Thanksgiving a trip to Trader Joe for chickenless strips on the way back from work is on my list tomorrow. Don’t you just love that instant pot I sure love mine so versatile. Wonderful mouthwatering article and I will be having soup tomorrow night thanks for the recipe. Hi Cathy, Thanks so much for your comment! And yes, the Instant Pot is amazing! I use it for everything. I hope your version turns out insanely well, like mine did! And do share your results with me! Hello Janani. I hope you are having a good time with the season. I wish you a happy Thanksgiving and merry Christmas in advance. Thank you for sharing this awesome delicacy with us. I think this Vegetarian Chicken Noodle Soup is the perfect thanksgiving side dish just as you have said. It looks delicious and rich too. I love chicken. You are amazing, you discovered the way how to imitate chicken meat appearance, I people will enjoy the savor of your recipe and love to have it over their table. I would love to try it also in my own home. Hi Jimmy! Thanks so much for your encouragement! I am so excited for you to try this out for yourself…and please share your results with me too! While I personally prefer Whole Foods (where I am, Whole Foods is bigger than Trader Joe’s) but this looks delicious! While I’m not much for making my own soups during the warmer months, there’s something about making my own soup during the Winter that just seems to make them taste better (probably just because it’s so cold out, lol). Thanks for a simple, tasty looking recipe! Hi there! Thanks for your comment! Whole Foods definitely carries TVP (textured vegetable protein), which is another great chicken substitute and will work for this soup. Target also carries Lightlife, which has a really tasty chicken substitute as well. Hope you make this and love it! Tell me, did you have a Jewish mother? Nothing more wholesome than a chicken soup, and you are right, the chickenless strips look like real chicken. I imagine they taste quite scrumptious as well. When I make chicken soup, I always get the frozen egg noodles, because then they are just like home-made noodles. Delicious! And, lucky you, to be close to a Trader Joe’s. I love that store, but haven’t been to one for a while because there is not one close to me in Alaska. You will have to enjoy the store for me. Thanks for including such a yummy-looking soup recipe. Hi Fran! Nope, no Jewish people in my family LOL but I just had to try out the American classic comfort food to see what all the fuss was about! You don’t need to go to Trader Joe’s for this, though they carry it. I have seen Target carry Lightlife brand, and I am sure Safeways and Whole Foods for sure carry TVP (textured vegetable protein) which would also work well for this! I hope you try it out and let me know how it is! Okay, I’m seriously becoming a recipe stalker of your website. I’m really not a vegetarian so I struggle to serve vegetarian options. But the recipes seem easy and your suggestions make me, a carnivore, hungry! If this is your most favourite recipe, it’s definitely worth a try then. I see the pictures, I read the ingredients and I imagine myself enjoying it as a comfort food on winter days when I just want a nice hot soup with crusty bread. This would be insanely delicious with a nice crusty bread! Enjoy!! I did not know that there is a good cook in you sweety. I am going to try the begetarian chicken noodle soup , it already sounds yum! Thank you.